The question now is: what is a good conversion rate? The answer: it varies. What’s great for one industry might be below par for another. One multi-billion dollar company I once worked with had conversion rates of 41% for first-time visitors. And they still wanted more. The key is to understand the average e-commerce conversion rate and benchmark your performance against it. Once you know whether you are meeting the average for your industry, you can work to improve conversion rates until you’re in the top 10 percentile of performers. If your website is converting at around the average mark, you are under-performing. The first thing you should understand is that conversion rate is highly contextual. A store selling high-end electronics isn’t going to have the same conversion rate as one selling $10 t-shirts. Similarly, a store with a loyal email list of 100,000 hungry buyers will see far better conversions than one buying cold traffic off Facebook. Furthermore, the term “conversion rate” is generally used to signify the % of visitors that turn into customers. You might have different goals you are trying to optimize for (say, % of visitors who add a product to cart, download a lookbook or fill a contact form, etc.). The term “average conversion rate,” thus, can be a bit misleading. 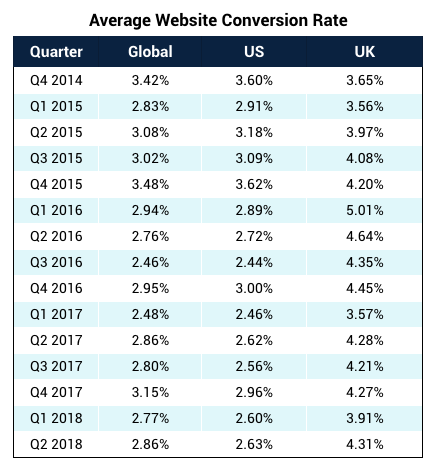 Where does our data on the average website conversion rate come from? 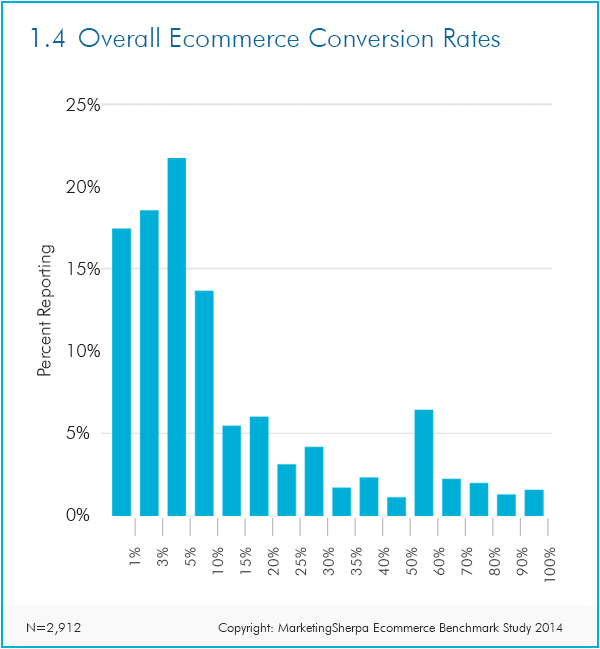 The average ecommerce conversion in the US is at 2.63%. The average ecommerce conversion globally is at 4.31%. In the early 2000s, Shop.org reported the average e-commerce website converted 3% of its traffic into customers. 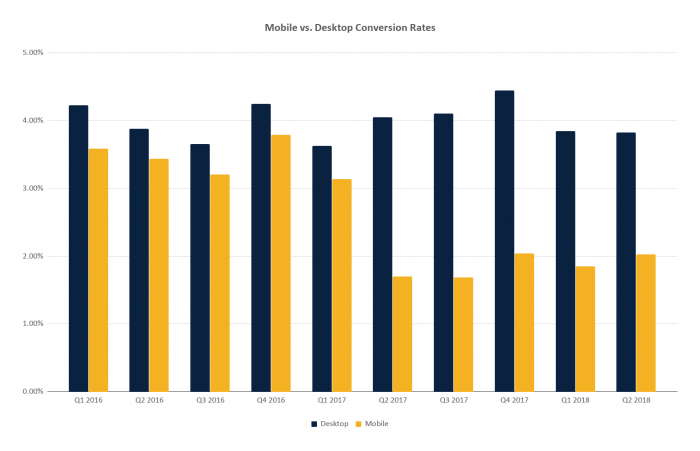 In 2014, MarketingSherpa pointed that the majority of stores had conversion rates in the range below 1% up to 5%, with few companies reaching higher rates. 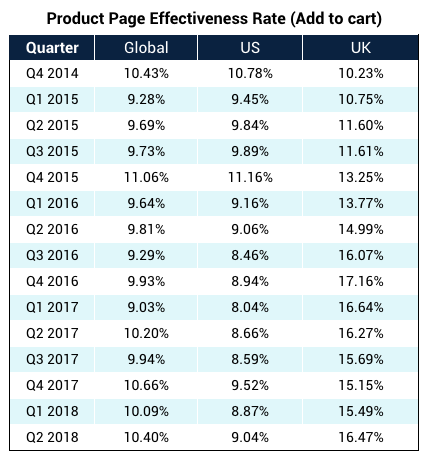 FireClick Index data from 2015 show an average e-commerce conversion rate close to 7.2% globally. Back in 2010, outdoor and sporting stores converted less than 0.5% of the traffic they receive. In 2015, these stores were converting 4.8% of their visitors into customers. This is close to a 900% increase in conversion rates. From Fireclick index findings, specialty stores convert at the highest average rates (7.6%), followed by catalog websites (6.7%), fashion and apparel (5.9%), outdoors and sports (4.8%), and software (4.1%). A 2014 benchmark study from MarketingSherpa, showed that business services, electronics, softwa, e and video games, and publishing and entertainment related products convert substantially better than other product categories. The study also found that stores that sell multiple products saw an average 17.2% conversion rate. Niche stores selling only one-category products, on the other hand, had a 16.3% conversion rate. This result goes against conventional wisdom that targeted, niche stores do better than general stores. The result goes against Fireclick index findings as well, which show a 6.7% conversion rate for catalog stores and a 7.6% conversion rate for specialty stores. Niche stores, in this case, outperform stores selling multiple products. 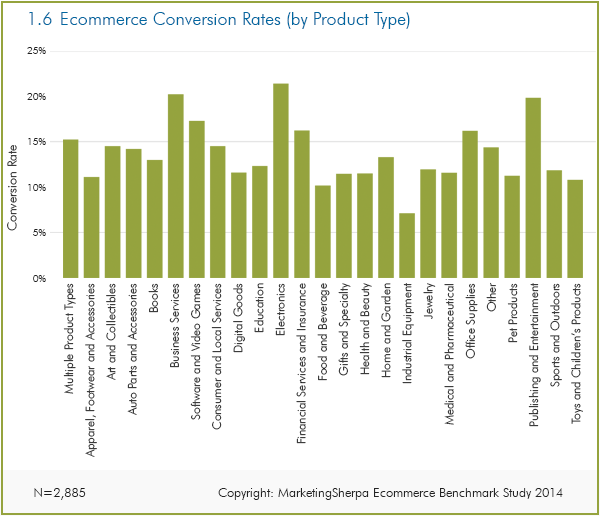 The following data shows the top 15 converting online retailers for 2014. By the end of 2016, traditional devices, i.e. desktops and laptops, reach a considerably higher conversion rate than mobile devices. 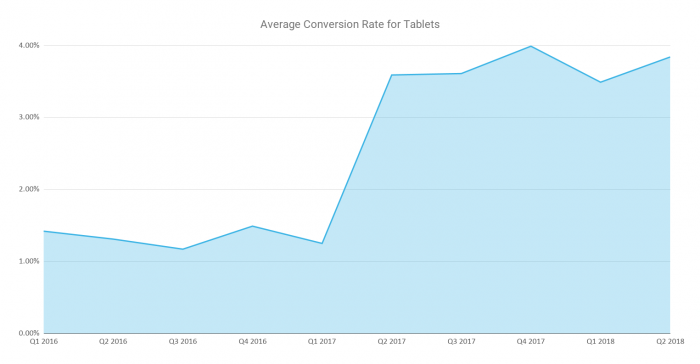 Among mobile, conversions on tablets more than double compared to conversions on smartphones. You will not find any published data on the average conversion rate for lead generation websites. Invesp internal metrics, based on approximately 35 different lead generation websites, indicates an average of 13% of visitors converted into customers, with the highest converting site sustaining a rate at 28%. Similar to lead generation sites, there is no published data on the average conversion rate for affiliate websites. 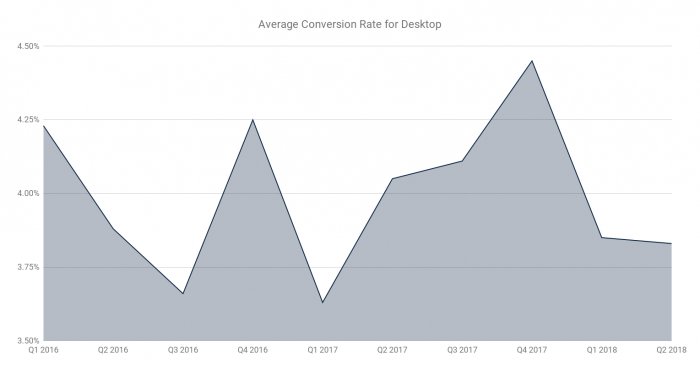 Invesp internal metrics, based on approximately 17 different affiliate websites, indicates an average of 26% of their visitors converted into customers. Companies offering freemium products are able to reach high conversion rates. Slack, for instance, converts 30% of free subscribers into premium paying customers. These are the conversion rates of some freemium providers, according to Business 2 Community. Over the last couple of years, there has been a massive push to use webinars as a lead generation activity to drive business leads. However, few articles and blog posts have addressed increasing conversions for webinar registration pages. The data we provide here is narrow and based on our own webinar registration page. The conversion rate for webinar registration pages varies depending on the type of webinar software you are using. GotoWebinar, which seems to be the most popular, might increase conversions anywhere from 5% to 15%. Conversion rate for webinar registration page depends on the quality of the visitors you are driving to the page, the webinar title, day, and time of day. The standard GotoWebinar registration page converts 22% of visitors. Custom-built webinar registration pages convert 35% to 45% of visitors. Mac users, at the 4th quarter 2016, bought more than Windows users, who bought substantially more than Linux users. During the 2nd quarter 2016, conversion rates were the same for Mac and Windows users. On mobile platforms, Android under-performs against iOS. In a famous conversion experiment, you give ten people a credit card. Direct them to an e-commerce website. Ask them to buy a particular item the store carries. How many of these ten people are able to complete the purchase? Remember, they are only required to perform the purchase. They are not spending their own money. All they have to do is navigate to a site, find an item, add it to their shopping cart and successfully finish the checkout process. Logically, you would guess that at least eight of the testers should complete the task. Wrong! When the experiment was done, only two were able to accomplish the goal of buying the item. If only two concluded the checkout process under these circumstances (full motivation and no fears or objections), it is no wonder that everyday consumers do not convert on the web. We highly recommend running the same test for your website and examining the results. So, what can you do with this categorization? Think about your own website and consider the type of browsing vs. buying of your average consumer. If you know that visitors tend to use your website for research but do not convert online, what can you do to convert more visitors into buyers? As we saw earlier, conversion rates vary greatly across stores. Some stores see conversion rates in excess of 10%. Some struggle with rates under 2%. According to WordStream, for example, the top 10% of stores see a conversion rate of nearly 11.5%. Which is to say, getting an average conversion rate is really not good enough for an e-commerce store. Instead of benchmarking yourself against the average, focus on what the top 10% are doing and reverse engineer their efforts. 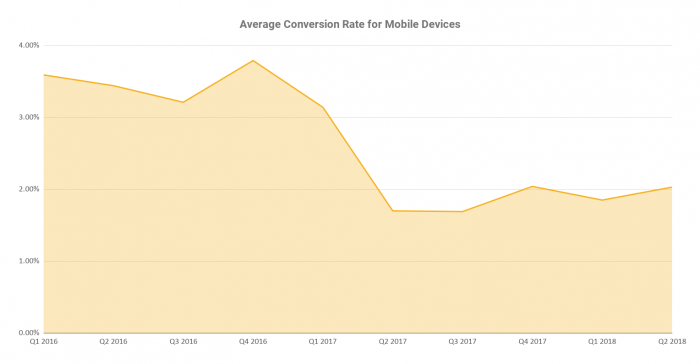 From the above charts, it is clear that social converts fairly poorly as compared to search and email, both of which underperform against direct traffic. If improving conversion rates is your priority, focusing on better converting channels will yield better results. Dig into your analytics report to see where most of your traffic comes from. If your top channel is social and you have very little direct traffic, it might be a good idea to divert marketing resources to PPC or invest in an email campaign. Similarly, email yields better conversion rates than social and search. Consider investing in an email marketing campaign to push up your store’s overall conversions. Different products and product-categories will have different conversion rates. Dig through your analytics to see what pages convert best. These should be the top priority in your marketing campaigns. For example, if your t-shirts convert better than your shoes, make sure to promote the former on your site and your marketing. At the same time, also consider what products contribute the most to your bottom-line. A $1,000 product that converts at 2% is better for your store than a $10 product that converts at 10%. Finding a product with a reasonably high order value and strong conversion rates can do wonders for your store. When split testing, it is easy to fall into the trap of making small changes (such as changing a button color) and expecting big returns. Such an approach will rarely, if ever, yield unicorn-level conversion rates of 5-10% or higher. To get to that level, you have to look beyond cosmetic changes. Overhaul page design. Experiment with minimalist pages, busy pages, etc. Be prepared to try out 10 or more radically different designs to see what truly works. Experiment with different offers. Instead of selling products conventionally, try to run a time limited sale (like Groupon). Change up traffic sources. Use the same landing page on different channels (Facebook, Twitter, AdWords, etc.). Try a remarketing campaign with top performing channel to push conversion rates even further. 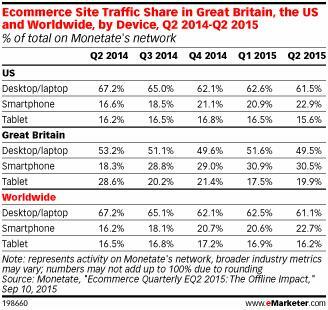 Smartphone traffic to e-commerce sites has steadily grown from 16.6% of all traffic in Q2 2014 to 22.9% of traffic in Q2 2015. 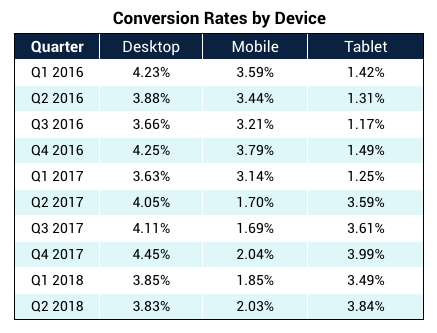 Smartphone traffic conversion rates, however, are significantly lower than both desktops and tablets. Personalization: By using location data and tracking user engagement, a mobile app can offer a more personalized experience to your customers. Notifications: You can use mobile notifications to alert customers about sales and deals – something that’s not possible (so far) with mobile websites. Design and Performance: A mobile app gives your designers more room to create innovative shopping experiences. Apps also perform better than websites since they can tap into the full power of the smartphone. This is one reason why some retailers are ditching mobile websites altogether and going ‘app only’. Even if you don’t invest in a mobile app, make sure to optimize your site for mobile users. According to Criteo, mobile-optimized sites convert more than 100% higher than non-optimized sites.